Neuros Technology has introduced a new version of its digital mp4 video recorder, an upgrade version of the MPEG-4 Recorder, the MPEG-4 Recorder 2 for PSP, device that records video straight to memory cards for Sony’s PlayStation Portable (PSP), without requiring a Mac or PC to transfer first. 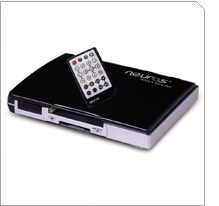 The Neuros MPEG-4 Recorder is a digital VCR for the portable video age. Instead of buying proprietary UMD discs at $20 each from a limited catalog, the Neuros MPEG-4 Recorder 2 enables you to effortlessly capture video content for the Sony PSP from any analog video source, including cable or satellite television, DVD players, VCRs, camcorders and PVRs such as Tivo. The video content is saved as MPEG-4 video files, eliminating the hassle of proprietary file formats. Utilizing Memory Sticks and Compact Flash (CF) or Microdives as the storage medium, you can record content on a card for viewing on your TV, Laptop, PDA, PSP, SmartPhone or Portable Media Player (PMP) like the Neuros 442. You can also transfer that content onto your PC via a card reader (not included) or other USB enabled device. Roughly the size of a PDA device, the Neuros MPEG-4 Recorder 2 hooks up to your existing home theater components, and allows you to view still photos on your TV or listen to MP3 audio files through your stereo. Additional features include upgradeable firmware for future functionality expansion. No PC Required. Memory Stick and CF Storage card required but not included. The MPEG-4 Recorder 2 is just like an easy-to-use, free-standing VCR that records onto digital memory cards instead of VHS tapes so that the video is playable directly on the PSP or other handheld devices.